Are you new to WordPress? Here you will find an easy tutorial on how to develop a WordPress website, that even a non-tech geek will understand in minutes. Today, having a website or blog can establish your existence in the digital world. It’s a way to promote your business, make yourself known, or channel your passion to the world. Yet, many beginner stumble at the start—thinking that they should hire a professional to set the website, while everyone can actually set it on their own. So, where do you need to start? WordPress is great for blogging or simple website. It is easy to use and highly powerful. This platform is also very flexible; you can create a simple blog to a complex website with this platform. WordPress is essentially an open source content management system (CMS) that is written in PHP. It’s free source and can be installed right away. This platform is one of the most popular among others similar blogging platform, beginner-friendly, and allows you to have your own domain. Having your own .com makes your website more personal and credible compare to Blogspot. In the long run, you can even make money by monetizing your WordPress! There is two ways to use WordPress; either host it for free or host it with your own domain name. For the first option, you simply put your WordPress website on a company or someone else’s website. They will manage all technical aspect of your WordPress and you will have a subdomain name for your website. It will appear something like this; yoursite.wordpress.com. You don’t have to pay anything for the service, though you cannot gain full access to plugins and certain features. Some minor drawback includes “ads-supported” features, means that your blog will have some ads randomly displayed on your page. Then, have fun with more than 5,000 themes to customize the look of your blog or website that suits your taste. If you want a full-service hosting with complete features, full access to plugins, and ads-free, consider using a hosting company where you will have the freedom to choose your own domain name. There’s a lot of hosting companies and website builder to make your dream website come true, who provide services to install and setup the WordPress on your behalf. Hosting company provides numerous templates that you can choose to tailor your blog/website according to your business type; whether it’s for your personal blog space, design agency, e-commerce, arts & entertainment, to property and construction. Pay extra attention on choosing a hosting. You want a reliable host to take care of your blog/website professionally. Choose a widely trusty host with a good uptime, which won’t go offline at any given times. Pick a host with good support service, in case something goes wrong in unexpected times. Lastly, make sure you know what you pay. Take a host with clear packages, where everything is stated and no hidden fees that can surprise you in the future. Some people really enjoy getting all technical and having total control of their website. If that’s you, then you might want to host your own WordPress. You need to install the WordPress program itself and register your own domain name. While the WordPress itself is free, the domain is not. Allocate some of your digital funds to pay the domain name registration and yearly web hosting. (P.S: It doesn’t cost much! Only around $100 per year). This way, you will have complete access to your WordPress, tweak it according to your wish, and is a lot more flexible. As mention above, you can either install WordPress by yourself or have the hosting company to install it for you. As beginners, you might want to choose the later option. It’s super easy and requires no coding. If you have been wondering on how to develop a WordPress website by your self, look no further and start follow the tutorial below. In this tutorial, you will learn to build your site in WordPress from scratch. It’s going to be a bit technical, but worry not. Follow these simple instructions, and you’ll get your own WordPress website in no time. Before you start, please make sure that your hosting company meet the standard minimum requirement to run WordPress. You need a host with PHP version 5.2.4 or higher, MySQL 5.0.15 or higher or MariaDB 10.0 or higher, and support HTTPS. Luckily, most of hosting company today have met the minimum requirement to run a WordPress website. Pick and purchase your domain. A domain is a permanent URL address for your blog/ website. Most of the time, a unique and catchy name that you wanted are taken, so do come with a handful of alternatives. Sign up at your hosting site. At this step, you need to choose your plan. Hosting companies usually have multiple choice of plan; one-domain or multiple-domain package. The latter means you can register more than one domain (a.k.a blog/ website) under one host. Fill every information detail during the sign up process and create your account. Here you need to register an active email address that you regularly use. The rest is just as simple as creating any account; choose a username and password. Complete your hosting registration. Check your email and click your activation mail. Your blog/ website is going to be ready anytime soon! Your activation email should include instruction details on how to log into your cPanel. It’s the web hosting control panel where you can manage everything on your site and install the WordPress. 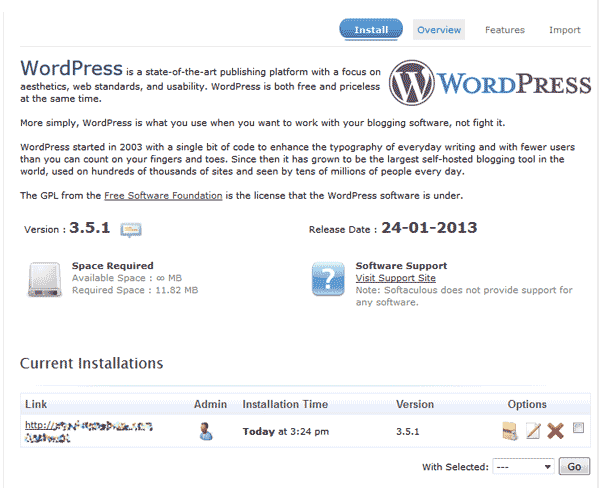 It’s time to install your WordPress! 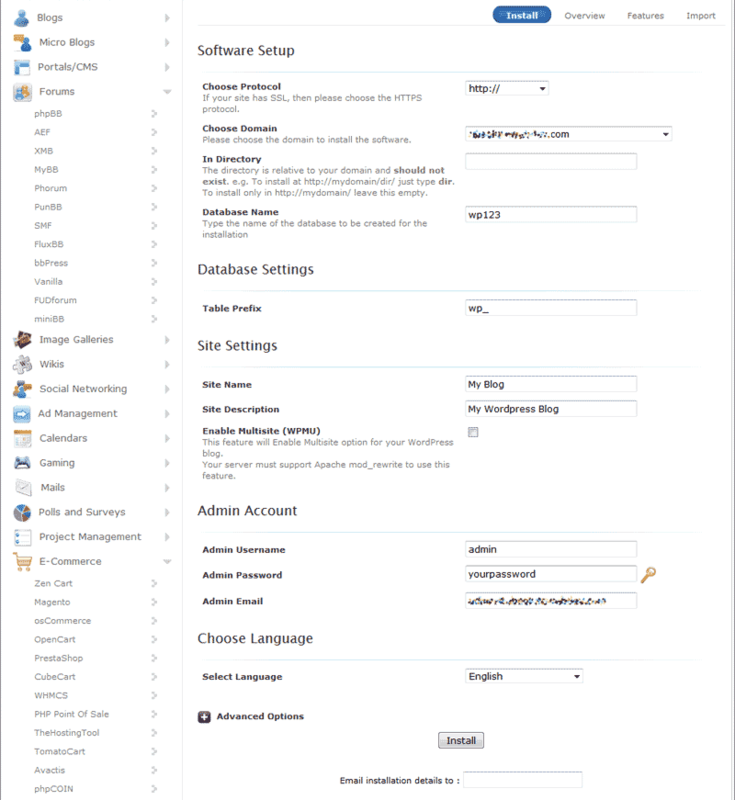 Go to your cPanel and choose ‘software’ section. Then, click on ‘Softaculous’ icon and click on WordPress logo. That’s the WordPress program that you need to install. Afterwards, you will be asked to choose your domain from dropdown menu. Fill installation detail. This will include your Site Name, username, password, and valid email address. Site Name means the title and tagline of your WordPress. You want your website to have a catchy name to remember, so its time to give a proper title to your website. 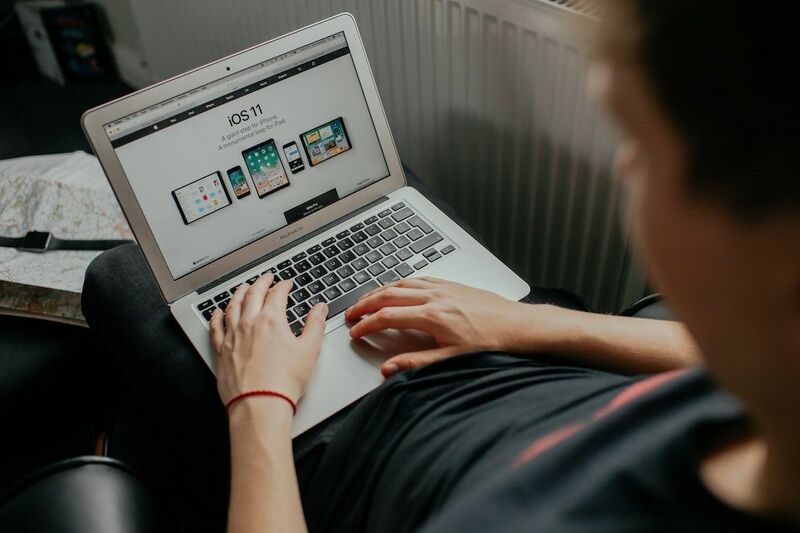 The title will be the name of your site, while the tagline underneath carries a brief description of what your site is about. Keep them short and sweet, make it as your punchline! Check all the checkboxes and then click install. 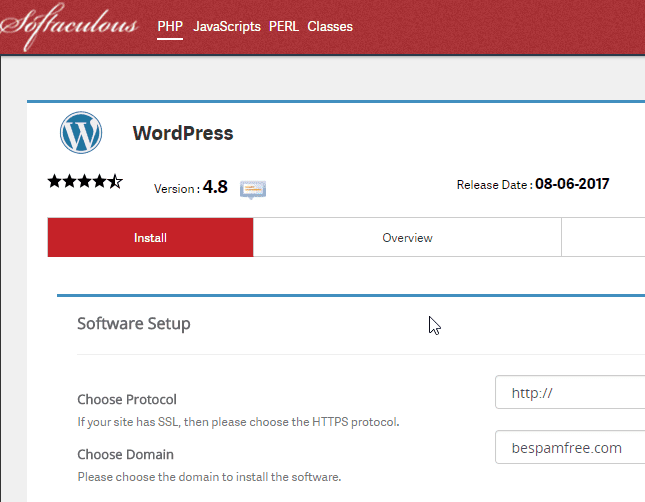 After the installation complete, your WordPress is ready to use! Access your WordPress’ dashbaord page by typing http://domainname.com/wp-admin.php (replace the dominance with your actual domain) in the URL bar. Then, log in using your username and password. Congratulation, now you’re ready to write your first post! Finally, we come to one of the most fun parts; deciding a theme! 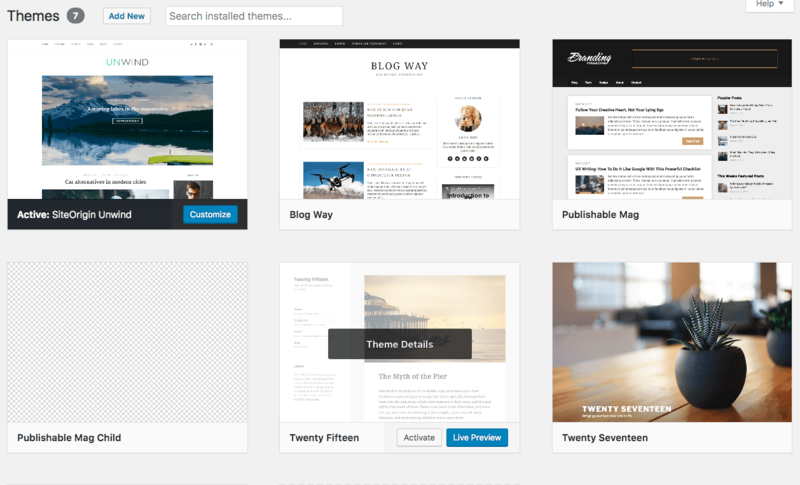 The first time you logged in to your WordPress, you will have a set of theme waiting in the front page. Pick one design that really matches the purpose of your site as well as the tone or personality of the site that you want to present. With over 5,000 free designs to choose from, you can spend hours scrolling down the themes gallery. Feel free, you can change the theme later on without much problem. 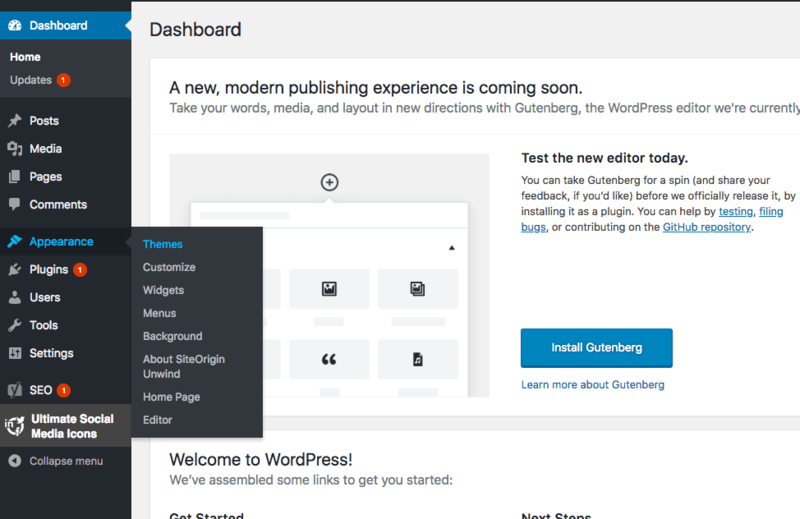 Next on how to use WordPress tutorial, it’s time to explore the dashboard interior. When you get to the dashboard page, you will see a number of menus on the sideboard. Seeing them for the first time might get you confused, so here’s a quick guide for a starter. Posts: Here’s the place where you are going to write your blogs, post it, and view the old posts. Media: A post without engaging pictures is like a plain meal without spices. Media is the place where you add and store all supporting pictures. Comments: It feels rewarding when your posts start to gain responses from audiences. Here’s where you can manage all comments on each post. You can give a reply or delete inappropriate comments accordingly. Appearance: Do you wish to install the new theme you just downloaded or edit the existing one? Here’s where you can tweak your theme. Users: Sometimes a site is shared among several contributors—be it writers, administrator, or a programmer. 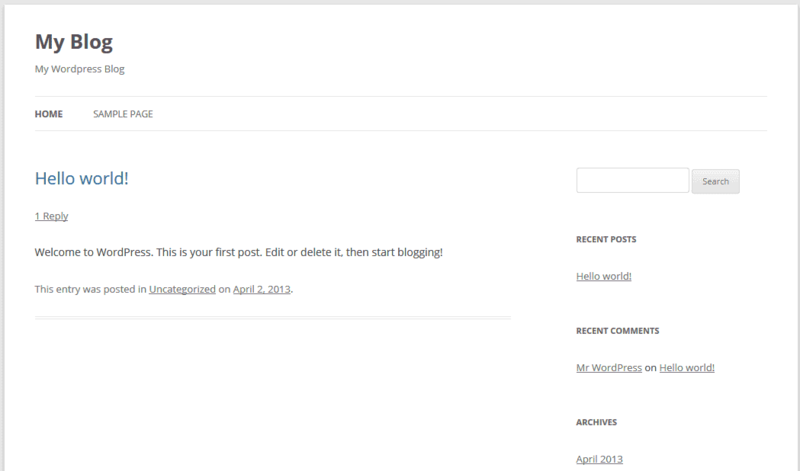 Add your colleagues as users so they can edit the blog posts as well. Plugins: Plugins is one of the most interesting parts of a site creation. This menu allows you to add and remove plugins that will give (or remove) a new feature on your site. Now, we come to a feature that confuses almost every WordPress novice. The plugins. What actually a plugin is and how it differs from a theme? Most importantly, how to use WordPress with these plugins? Meanwhile, you can think of plugins as the extensions of WordPress. Plugins are software, each built with special functions that can be added to a Wordpress website. They can greatly enhance, change, add, or even remove a function of WordPress software. Thousands of plugins are available in the market—and choosing the best for your WordPress can be a headache. If you are looking for an easy-to-install plugin with wonderful functionality, I highly recommend you to check JoomUnited out. Their plugins are built with design and functionality in mind—some of them are the one you never know you need them until you see them. Plugins help WordPress users to insert a function that is not originally supported by WordPress, such as inserting tables or floating sharing buttons bar. It also helps users tackle problems like slow speed login time, the most common problem among WordPress. JoomUnited handles this problem perfectly with Speed Up WordPress plugin, a powerful plugin that speeds up your site with technical and advanced features. This is one of the most recommended plugins for WordPress beginner, especially after Google recent update which put a fast-loaded site at a higher rank. The plugin will compress all cache and Gzip, clean up database, and a bunch of other tools to speed up your loading page. Another recommended plugin for WordPress beginners is the WP Meta SEO by JoomUnited. You know that SEO is very important when you are working with WordPress, and this plugin will make all the SEO work easier. Every WordPress users want their site to get the best SEO ranking, and this plugin will help you to achieve the goal.